Do you want to know our favorite thing about Caracas Arepas Bar besides the food? I’ll assume the answer is yes since you’re reading this review. It’s not the tall waiter who wears sunglasses inside...though, that guy is indeed the man. It’s the fact that once you get inside this tiny restaurant, the table you’ve been awarded is yours until you want to leave. Unlike most small restaurants where people vie for seats, Caracas doesn’t rush you. They actually encourage you to order little by little and keep eating until you’re happily bloated and full. 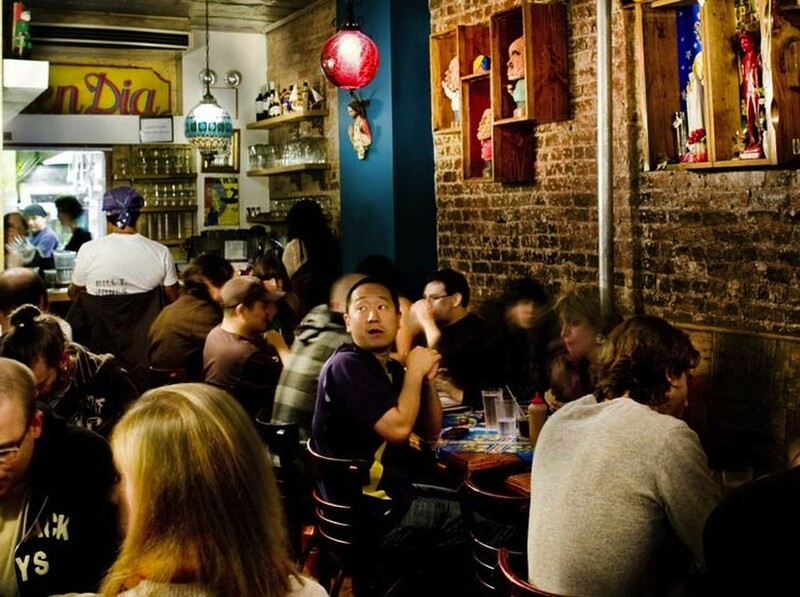 If you’re in a rush, stop into the Caracas To Go next door - but otherwise settle in for a not-rushed meal in this tiny Venezuelan restaurant in the East Village. They specialize in arepas, which come filled with different combinations of meat, cheese, and beans. The plates and other dishes are very good as well, so don’t skip over those, especially if you’re in a group. It’s a great choice for affordable eats, and works well for vegetarians. This arepa comes filled with grilled chicken breast with caramelized onions and cheddar cheese. We’re kind of surprised more of their arepas don’t come with caramelized onions. They taste like straight sugar. So good. Make sure you order this. It’s easy to get caught up in the arepas and overlook the “Plates” section of the menu. You’ll be sorry, just as we werethe first time we came here and failed miserably by not ordering this tasty corn pancake. It’s got the look and size of a burrito, stuffed to the brim with moist, shredded beef and cheese. All empanadas are served solo. The shredded beef is excellent. Big, moist and awesome. Shredded beef, black beans, white salt cheese, and sweet plantains. A heart attack waiting to happen but who cares, it’s worth it. Skip this. It’s too dry. Shredded Beef, Black bean, white salty cheese and sweet plantains - talk about a loaded empanada ... home run. Grilled chorizo, spicy white cheese with jalapenos, and sauteed peppers. This one is on the spicy side, and tastes even better doused in that amazing mango hot sauce that you’ll find on the tables. Roasted pork shoulder with tomato slices and a spicy mango sauce. Don’t miss the only pork arepa on the menu. Juicy and delicious. Grilled chicken and chorizo, with avocado slices and the classic and always enigmatic spicy chimichurri sauce. The chimichurri sauce steals the show. Fried sweet plantain balls stuffed with white cheese. These are the kind of balls that will make cheese obsessed females completely lose their minds Meg Ryan in When Harry Met Sally style. Watch out, she might crave balls of a different variety as her main course. FYI, bathrooms are a little tight. Good luck with that. Fried sweet plantains with aged cheese. If you’re lucky and they actually have it, this is what you’re ordering. The description says it all: layers of thick chocolate mousse and Maria cookies. 100% homemade.